With high temperatures reaching the fifties this week, the snow is finally – and slooooowly – starting to melt. However, it doesn’t melt at a uniform rate everywhere on the property. A number of factors can affect how fast the snow melts in a particular spot, one of which is aspect, the direction a slope faces. On the northern side of the lake, the sloping shore is facing toward the south, so it gets more sun each day and the snow melts faster as a result. You can see this same effect just driving along the roads here, with bare ground on the northern side of the road while the southern side still has a layer of snow. I’m going to be donning long underwear and snowshoes to trek into the woods this afternoon, but there is a glimmer of hope in our weather forecast for the weekend! 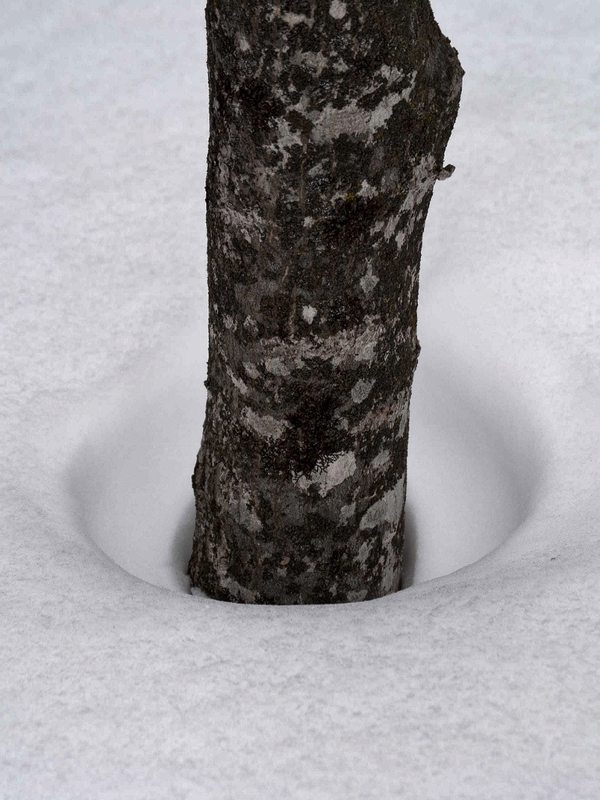 Why Does Snow Melt Around the Bases of Trees? I’m sure you’ve all noticed this if you’ve been in the woods in winter: as the season goes on (and on and on, if you live where I do), the first place snow starts to retreat a little is often around the bases of the trees. Why? The answer is actually not all that exciting. A few plants, such as skunk cabbage, actually do generate their own heat early in the spring, but as far as I know that’s not the case for the sugar maples and other common trees here. The most likely explanation is just that the relatively dark color of the tree bark absorbs more heat and, as a result, melts the surrounding snow. Still, any sign of spring is cause for celebration at this point! 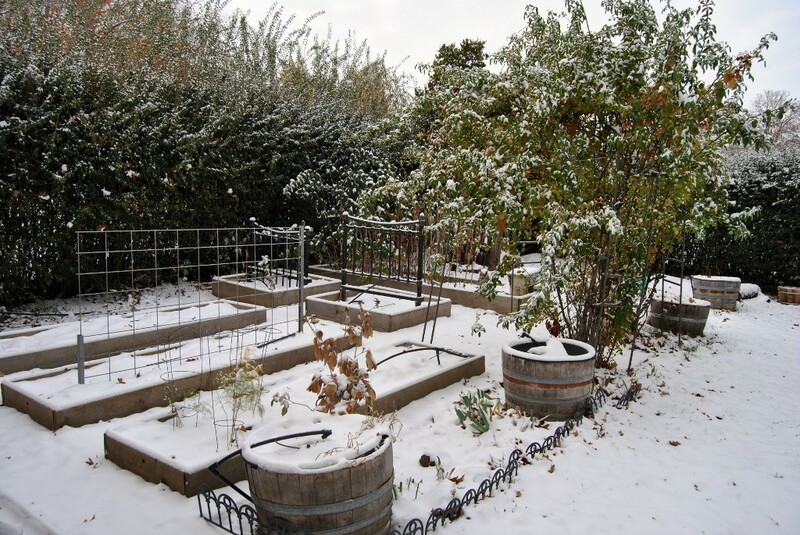 Author RebeccaPosted on Monday, March 25, 2013 Monday, March 25, 2013 Tags nature, snow, trees, winter10 Comments on Why Does Snow Melt Around the Bases of Trees? 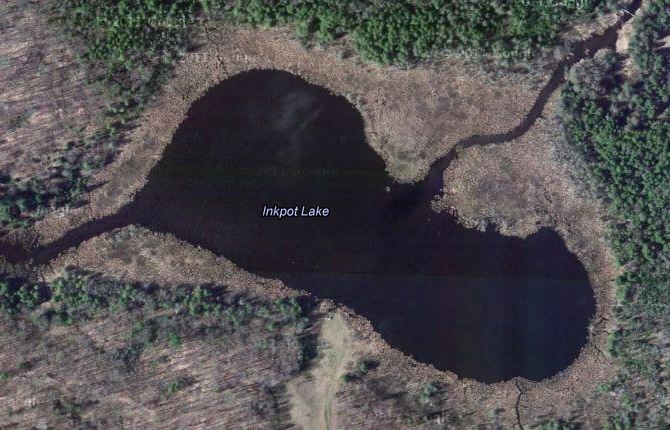 One of the lakes on our campus has the evocative name of Inkpot. Unlike the rest of them, which are clear, pristine, eutrophic kettle lakes, take a canoe out on Inkpot in the summer and you’ll discover that it’s surprisingly murky and full of aquatic vegetation. Part of the reason for this, according to one of the science teachers here, is that it’s at a slightly lower elevation than the other lakes; another reason is that a sluggish stream flows through it from a nearby spring, meaning it’s the only lake on campus with any current. There’s even an old beaver dam at the outflow, although it doesn’t appear to be actively maintained by beavers anymore. The current means the ice is thinner on Inkpot than on the true kettle lakes, and I’d heard that last weekend someone saw otters there, coming and going through a small patch of open water. Today a friend and I skied out that way, and while we didn’t see otters or any open water, we did see otter tracks of varying ages criss-crossing the surface of the ice. 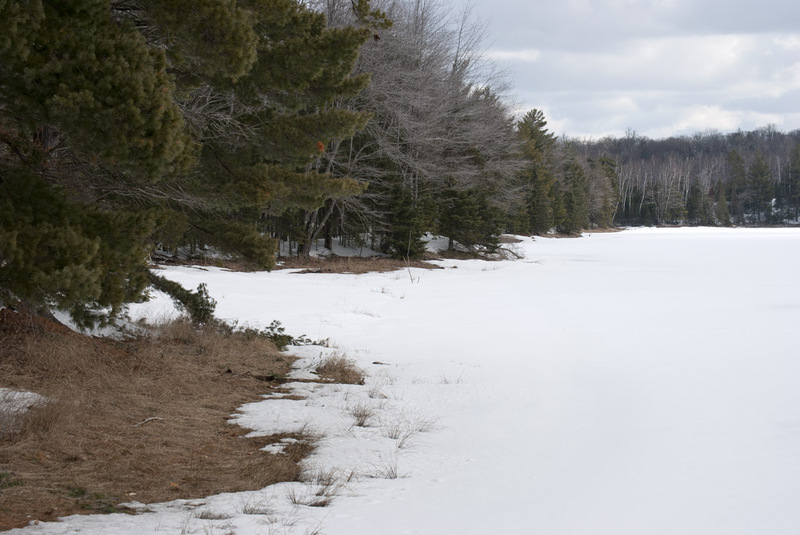 At one point an older set of tracks appeared to vanish at the lake’s edge, and I managed to push my skis through a snowdrift to get a closer look. 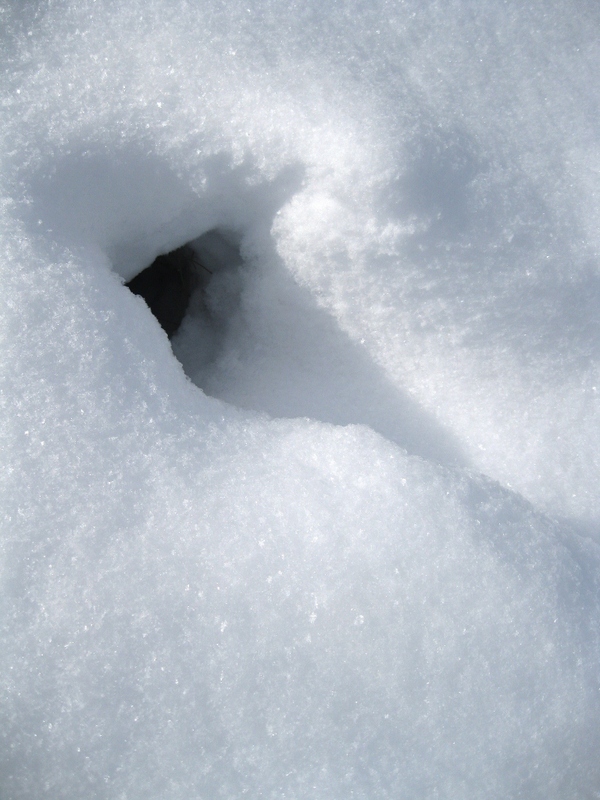 So yeah, today I learned that otters make snow tunnels just like mice and squirrels do! One other small point of interest: getting out to this lake, at the far western end of the property, required skiing a much longer, hillier trail than I’d done before, and actually getting to the edge of the lake required leaving the groomed trail and going down a slope through a couple feet of fluffy, unpacked snow. And then back up it when we were done. On skis. There was a lot of screaming and falling. Leanna, the friend who went with me (and the person in the panorama above), composed a haiku about the experience that she wanted me to share with you. She is adamant that “sp-lat” should be pronounced as two syllables. Due to some temperature ups and downs, when I went for my walk Saturday afternoon there was only a light coating of snow on the ground. (This is no longer the case, thanks to a snowstorm Sunday night.) Animal tracks show up beautifully clear and sharp in half an inch of snow, and even the tracks of common species can be fun to find, photograph, and follow. Based on the size and shape, I’m pretty sure these are raccoon tracks. 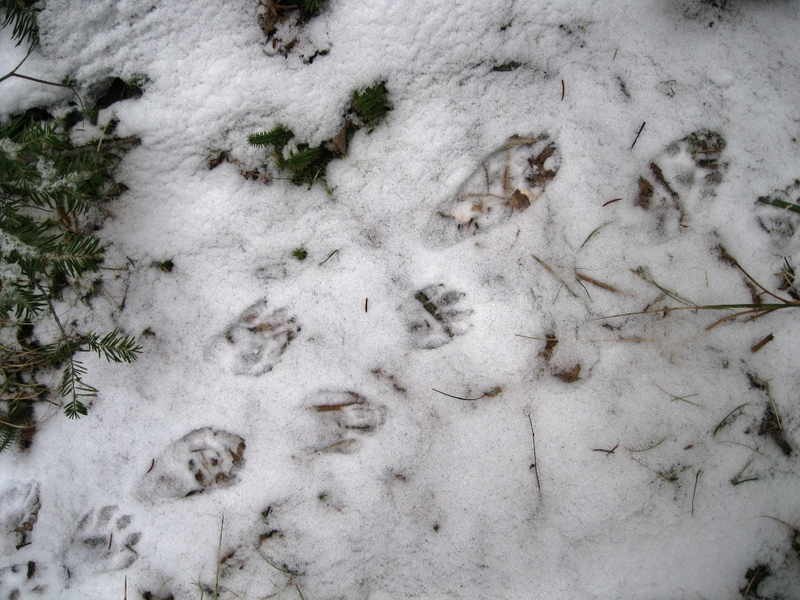 Skunk tracks look similar but are smaller, and I don’t think the pattern is right for a fisher. You can see the five long toes on both the front and hind feet (the tracks with the bigger, longer pads are the hind feet) and the dots left by the claws. 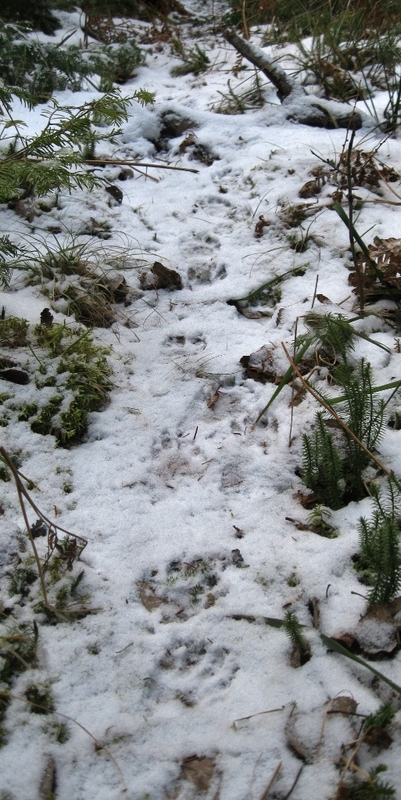 On the same walk I found the tracks of deer, red squirrels, gray squirrels, mice, a small weasel of some sort (we have long-tailed, short-tailed, and least all here), and something that I think was probably a fox. The woods are full of life, and if you play detective you can always find clues, even if you rarely see the animals themselves. Okay, I didn’t actually see the otters themselves, but this is almost as cool. 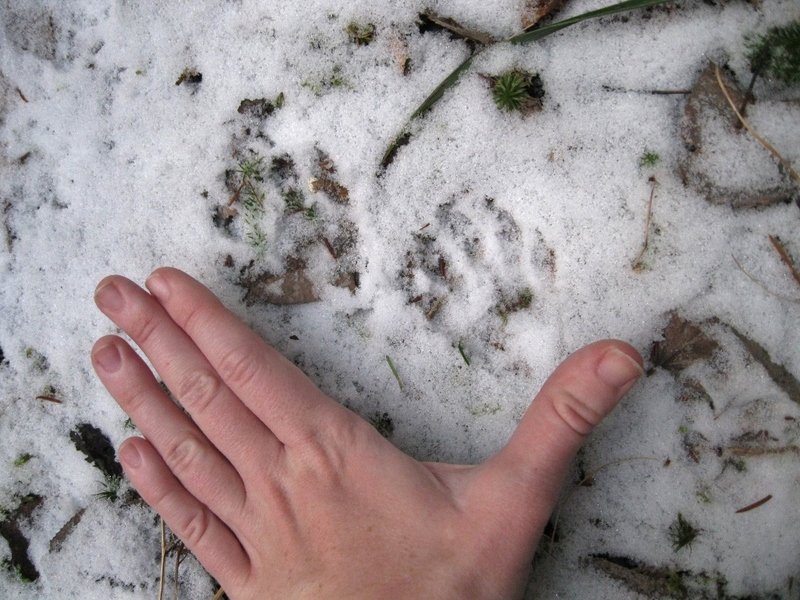 This week I’ve been teaching my students the basics of identifying animal tracks. (I’m hardly an expert on the subject myself, but I know enough about it to teach a short lesson, anyway.) 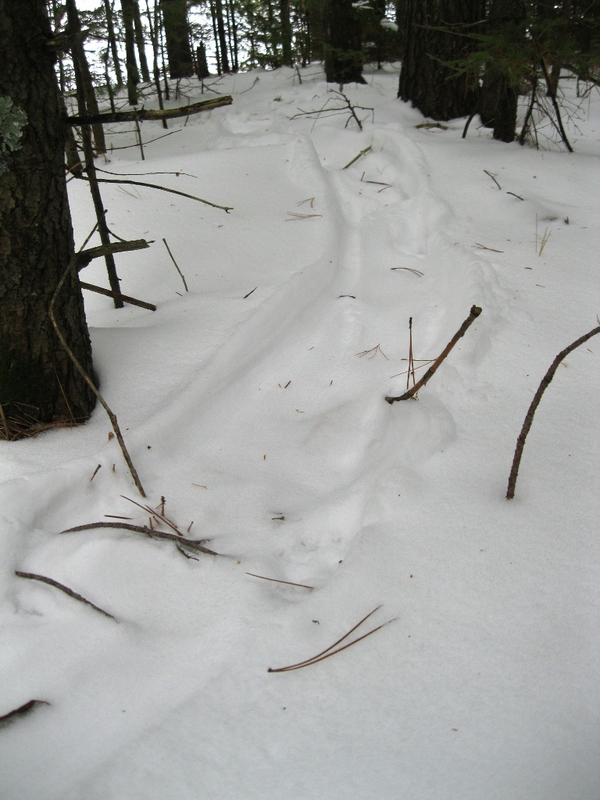 In the woods near one of the lakes we found this odd groove in the snow, as though something had been dragged. Can you see it? I’ve been having trouble getting tracks in the snow to show up well in photos. It was a bit of a mystery until we followed the trail down to the edge of the lake. 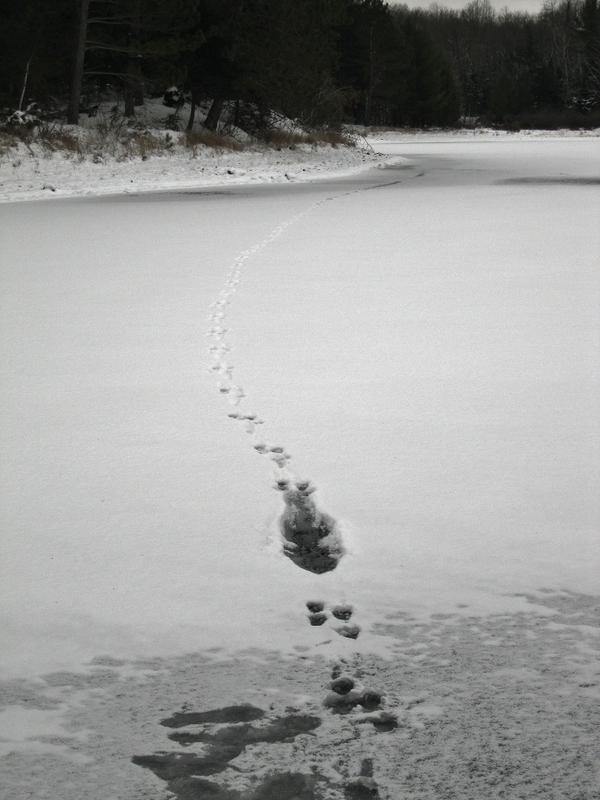 An otter had been playing in the ice and snow, running around and doing belly slides. What looked like a trail left by something being dragged through the snow was actually from an otter pushing itself along on its belly. I love that otters seem to enjoy playing in the snow every bit as much as people do! Speaking of people playing in the snow, you haven’t lived until you’ve watched a group of teenagers play snowshoe kickball. Snowshoe kickball is just like regular kickball, except it’s played in the snow while wearing snowshoes, and there’s generally a lot of falling down. There’s a reason why we have snow on the ground when most of Wisconsin still doesn’t–we’re far enough north to catch lake effect snow from Lake Superior. 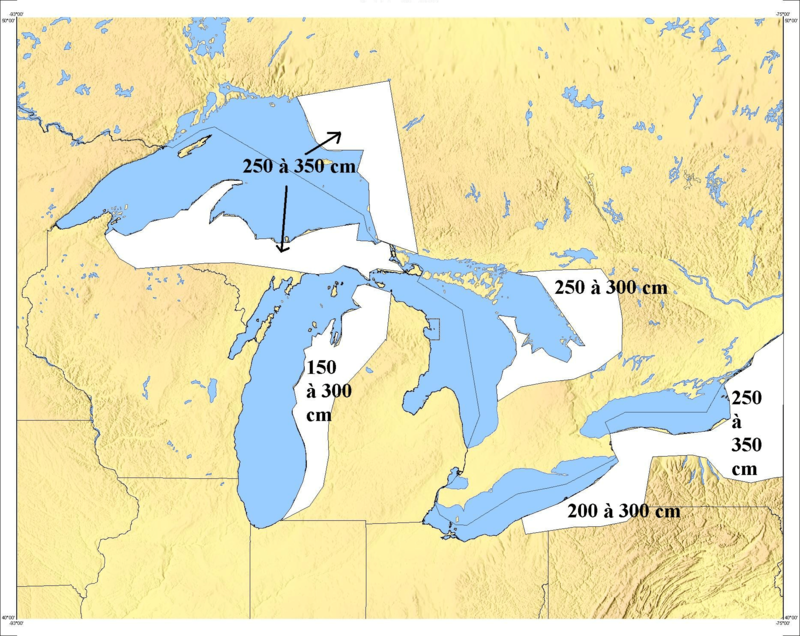 Most of the Great Lakes are too big and deep to completely freeze over in the winter (Lake Erie is the only exception). 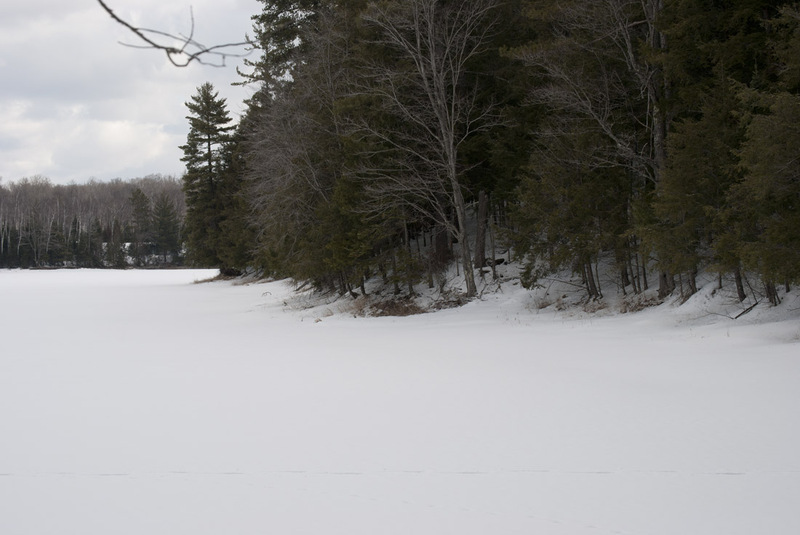 As a mass of cold air moves across the surface of the lake, it picks up moisture, which it then dumps as snow when it reaches land. The Upper Peninsula of Michigan is one of the snowiest parts of the country, and as a lot of you know, I live right on the Wisconsin/UP border. The Great Lakes snowbelts. In French, but you get the idea. I’m not complaining. Nothing quite compares with the quiet of woods in snow.